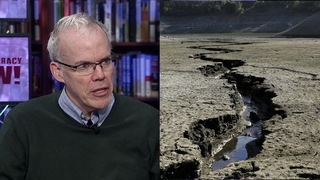 In Warmest Year Ever, Climate Change Ignored Again at Debate | Democracy Now! executive director of 350 Action. The presidential and vice-presidential debates have concluded without a single question about climate change, even though 2016 is on pace to be the warmest year on record. We speak to May Boeve, executive director of 350 Action. NERMEEN SHAIKH: During Wednesday’s debate, the phrase “climate change” only came up one time. HILLARY CLINTON: I want us to have the biggest jobs program since World War II, jobs in infrastructure and advanced manufacturing—I think we can compete with high-wage countries, and I believe we should—new jobs in clean energy, not only to fight climate change, which is a serious problem, but to create new opportunities and new businesses. AMY GOODMAN: On Wednesday night, I got response from May Boeve, executive director of 350 Action, about the failure of the candidates and debate moderators to address the issue of climate change in the debates. MAY BOEVE: Right, and we all deserve so much better than the political conversation that has been had in this debate and in all of the debates. And the debates are obscuring serious issues, like climate change and like so many other problems that we’re facing in this country and around the world. And it’s true, the question was not asked. It was brought up in the context of a question about jobs. But there’s something important in the answer, which is that Clinton is speaking to progressives. She’s speaking to the progressive movement. The way that we’ve been trying to build a much bigger movement that’s focused on the economy, the climate crisis, injustices of all kinds, and weaving those movements together, that was what that answer was trying to speak to. She tied it to debt-free college. She tied it to Bernie Sanders. She tied it to having the wealthy pay for these things. So, those are clues. And she’s going to need progressives to win, and she’s going to need us to govern. And so, that’s important, and we’re going to keep pushing. And as many of the guests have said tonight, it is all about the movements. But one thing that was, I think, shocking and scary here is that we know that to get the climate policy that we need, we need a functional democracy. And questioning the very idea that that can work is as big of a threat to climate change as any number of other issues. So, that was shocking, and we’re paying extra close attention to that. And I think Donald Trump’s disastrousness just reached another level tonight. AMY GOODMAN: That’s May Boeve. She’s head of 350 Action, a climate justice group.